Not sure why the choice fell on me to review this album. Perhaps because I grew up speaking Russian (Woodscream hails from St. Petersburg, Russia), or perhaps I have reviewed some pagan/folk oriented metal on these pages before, mostly from Russia and my native Ukraine (Arkona, Munruthel, Paganland, Stryvigor), or maybe the choice was totally random. At any rate, I am happy to present you Woodscream and their newest creation Octastorium. After a few singles and an EP, Octastorium is the band’s debut full-length, the name of the album (entirely my guess here) deriving from the album containing eight stories/songs. If you were to take a look at the band picture (a couple of ladies, every band member wearing tribal clothes) and read the instruments used in Woodscream in addition to traditional metal pieces (violin, flutes, whistles), without listening people could be jumping to conclusion that we are having an Arkona clone riding the latter band’s wave of European popularity. 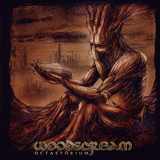 While Woodscream is also playing folk metal, it is trying to be its own band, not settling for a copycat status. One of the most prominent differences – while a Russian band, and singing their lyrics in Russian as well, Woodscream does not use a lot of outright Russian influences in their melodic approach. If anything, songs like Alan and playful Zov are more Celtic, than Russian, reminding of Cruachan and Celtachor. Also, a pair of instrumental pieces An Dro and Witnesses of J could be heard in an Irish pub with some Russian longing achy feeling when the voice comes along in An Dro. So, calling Woodscream a folk band, rather than a Russian folk band is the more proper description. Throughout Octastorium the band concentrates on delivering short, punchy, catchy songs, driven by the aforementioned folk melodies laid on top of not overly complicated muscly riffs. A simple familiar approach, but Woodscream pull it out well. The songs stick with you, there is a replay value in these compositions, whether you want to go with the melodic flow one more time, tap your feet to the familiar fast beats (Koval’) or listen more carefully to the lyrics, if you can understand Russian, of course. Not all songs on the album are happy-go-lucky drinking pieces. Lesnoi Tzar and slower heavier Voron have some pretty tragic story telling, and while I loved the verse of Voron, and the overall flow of the song, I thought the story itself (of the girl losing her lover on a distant battlefield) was left a little open-ended. Vocally Woodscream is a combination of the high boyish aggressive female vocals by Valentina Tsyganova and standard issue growls by guitarist Alexander Klimov, and two do not overlap in duets much. He goes well along some muddy bottom end (Top’), while she may feel powerful and fiery in some of her parts (Top’, Lesnoi Tzar), and she definitely tries to climb the ladder up high (Top’), which I, personally, did not think was always necessary. She is not some gently cuddly creature, so rather than a Beauty and the Beast, I would say Woodscream is more like an Amazon and the Beast. Not a bad combination. The use of folk instruments is where some may take issue with Woodscream. Celtic violin is intensely prominent in spots (Alan, quick inserts on Lesnoi Tzar) and on instrumentals, and that is fine, but at times flute/whistle combination becomes a little incessant and overbearing (Koval’). It is much better when the balance and unison is found between instruments (the closure of Koval’), and the flute definitely does not seem out of place next to the bass runs in Voron. Octastorium is a good experience when you are in a mood for simple sing-oriented folk metal. From here Arkona would have tried to add more and more layers. Another direction would be to get more poppy, but that is something probably good for getting airplay on Russian TV Channel 1 in their numerous projects rather than growing band’s credibility. Hopefully that is not going to be the direction the band takes.